* This page provides describes monthly updates for the Vectors, AirVectors, and DayVectors websites, current website statistics, and personal information. Entries in this last month's DayVectors online blog include: US Constitution (series), repairing the welfare state (series), China's Belt & Road Initiative (series), finding new RNA viruses, dark energy changes & blazars versus star formation, history of string and rope, AI-generated fake faces, wi-fi 6 now being introduced, timing the era of the Deccan Traps, Chinese counterfeits persist, and converting old cars to electric vehicles. * I was reluctant for a time to add personal information to this site, since as a policy I have done everything to avoid hype here. However, I really do have to establish my credentials, biases, and agenda for readers, and besides it is useful to be able to have something to pass back to readers when they ask questions about me. This should distinguish me from the other Greg Goebels on the web, the assortment including an ambitious automotive sales manager, an Australian political activist, an Anglican minister, a judo instructor, a jazz pianist (whose father is also Greg Goebel, we've chatted), and so on. There was also a Greg Goebel who was flightcrew on an A-6 Intruder strike aircraft in the late 1980s, but I'm not him, either. Aviation enthusiasts may wonder if I am any relation to fighter ace Bob Goebel. My father was indeed Bob Goebel, but not the one who was a fighter ace, Dad was a supply sergeant in the PTO rear echelon. "It's a small world, but I wouldn't want to paint it." 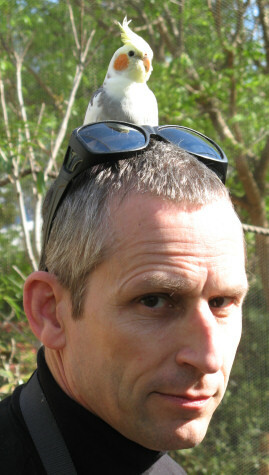 I'm a tall and thin Anglo guy, possibly with a bit of Cherokee blood, with short-cropped gray-streaked brown hair. I used to keep it long, but scalp problems forced me to change my ways of living. Bachelor, live by myself, tend to the reserved, not keen on disputes. Hobbies include aerobics; playing the piano (or electronic keyboard to be precise); photography, digital drawing, and retouching; Japanese language and culture studies; and sci-fi videos & animation & comix. Of course I write a lot on various subjects, too, but you've probably figured that one out. Clumsy piano player, BTW, it's always nice to have a hobby one has no natural skill at to foster humility. Writing in contrast comes to me naturally. I'm largely apolitical, tending towards middle of the road pragmatic politics with a Zen flavor. As far as religion goes, I'm an apatheist, having no interest in whether someone strongly believes in gods or just as strongly does not -- neither endorsing religion nor feuding with it, at least as long as nobody brings the fight to me. As a friend of mine once observed, I refuse to belong to any organization that would consider me as a member. * The picture above was taken in 2008, during a visit to the Dallas Zoo. * This website evolved from my tendency to take notes. When I want to learn something, I write everything down so I can retain the information and refer to it later, as well as organize my thoughts on it. This has led to a compulsion to write down everything I know. Once I have the materials, I might as well put them on the website and share them. Although I try to be thorough, none of these documents are scholarly; a scholarly document is a fine thing, but my target is readability. The documents are targeted at the high school senior / first year college / (and particularly) junior college level. They are written from the point of view of someone trying to learn a subject, not someone who is a recognized or even informal expert on that subject. I update them as I learn more. I make no claims for my level of knowledge on any subject since that knowledge is written down for inspection by readers, who can then form a judgement as they see fit. I am also not generally a fanatic about any one of the subjects I write about. Readers sometimes assume that since I wrote a book-sized document on codes and ciphers I must have a full-time interest in the subject, but that's not the case. It's just one of a list of interests. I'm more like the kind of guy who gets interested in some subject or other and decides to read a book on it, except that instead of reading a book I try to write one. I try to be thorough but make no pretense of being definitive. Despite my fascination with military hardware, I own no weapons worthy of the name.